Yesterday I used the VR system to practice a real-world cross country flight that I had planned for today: Albert Whitted to Crystal River to Ocala and back. I streamed the dry run, and if you didn’t see it live the entire 2:26 minute flight is online at YouTube (video below). Today I arrived at KSPG around 10:00 AM already noticing the unfavorable METARS along the route: fog and a low overcast ceiling that was supposed to persist until noon. Walking into the briefing room I said to my CFI, “If we go north we’re going to get stuck on top.” “Yep,” she replied, “so let’s go south.” I’d already made a cross-country down to Punta Gorda, and wasn’t really too excited about retracing the trip. So she suggested a longer flight (so I can log a longer solo cross country when the time comes), down to Ft. Meyers (Page airport, KFMY), up to Arcadia (X06), and then back to St. Pete (KSPG) crossing Tampa Bay from the East. It’s was a lot of fun and we had truly stunning weather along the way. If you want to simulate it yourself, here’s a link to the route on SkyVector. 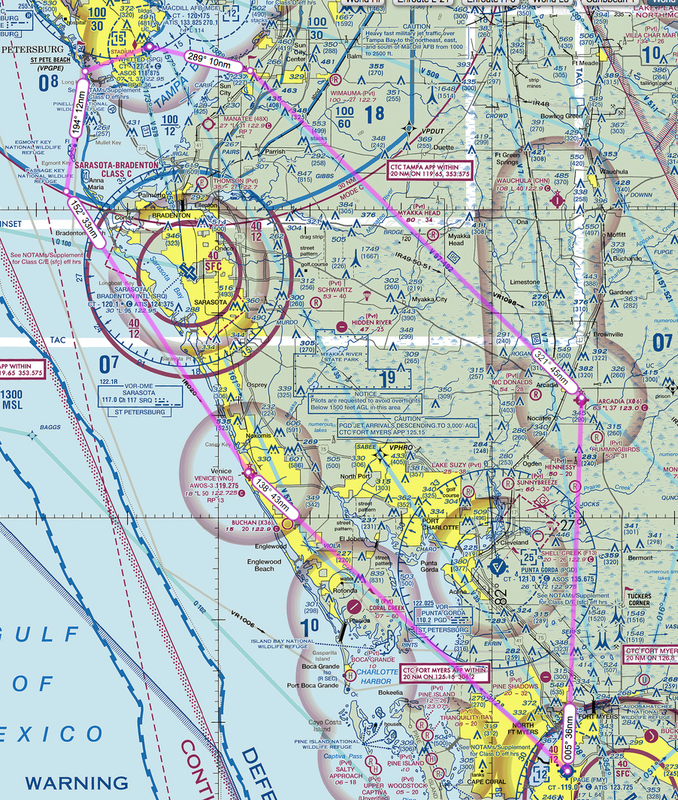 Climb to 2,000 ft by St. Pete Beach, then climb and cross the Sarasota Charlie and KVNC at 4,500. Once clear of KVNC, descend to 3,500. Once you’ve done the touch-and-go at Page fly the route back at 2,500. And again, here’s the vid of the (incorrect) dress rehearsal. Just finished A’s “On The Glideslope” real world cross country and presumably quickly arriving real world PPL certification. I flew IFR, according to the route published on sky vector for one reason and that is To document what three different views look like streaming…the same flight in NON VR, and VR under two different VR views. First view is single screen streaming entire fly then storing that flight so that tonight after the opening of “love letters“ a show that my wife and I are doing at the Union College theater tonight through Sunday , so that I can show y’all all the difference between plain and VR streaming with VR HMD. 3. Flying back from Page north-ward in side by side Full Stereo-Optical Three-Diminsional (SBS-3D) View. I think I mentioned A, my wife did a lot of theater in Sarasota and has been recently directing and teaching at Union College theater. So the VR stuff is to follow …hopefully after our opening tonite….we’ll see how much the show takes out of me…so it might be later. For anyone interested in seeing last night’s full Dress rehearsal, contact me at hesynergy@gmail.com, and I will give you the YouTube link. Thanks Chas. Break a leg! Once again on the Witted XCountry loop…crashed for the THIRD TIME….in the THIRD separate CLEAN install(native Global scenery USA East coast)OF XPVR6 install.